Uncategories Why parents feel happy to celebrate Lohri for girl-child? Why parents feel happy to celebrate Lohri for girl-child? Lohri is traced back to the tale of Dulla Bhatti. But by the end of January, small groups of boys ring doorbells of houses and start chanting Lohri songs about Dulla Bhatti. In return, people give them popcorn, crystal sugar, sesame seeds (til) or gur, as well as money. Turning these little boys back empty-handed is considered inauspicious and in such a situation, they change the tone of Sundar Mundario to Hukka Bhai Hukka, Eh Ghar Bhukha. While Lohri revolves around Dulla Bhatti, a Muslim highway robber, who lived in Punjab during the reign of Emperor Akbar. Besides robbing the rich, he rescued Hindu girls being forcibly taken to be sold in slave markets of the Middle East. He arranged their marriages to Hindu boys with Hindu rituals and provided them dowries. Understandably, though a bandit, he became a hero of all Punjabis. So every other Lohri song has words to express gratitude to Dulla Bhatti. More than ever, Lohri, the harvest festival that celebrates fertility and the joy of life, is increasingly being celebrated for the girl child with raising awareness about gender equality and women’s empowerment. Added to this is the realization that equal opportunity, equal behaviour, equal respect and equal status are the rights of any child, irrespective of gender. 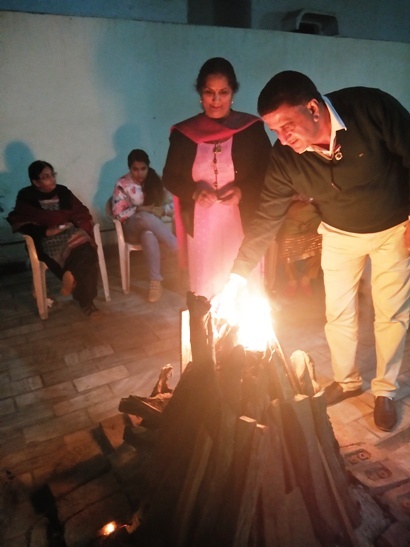 Lohri marks the end of winter and is celebrated on the last day of the Paush month in the native calendar and marks the beginning of Magha, which falls around January 12 or 13 in the Gregorian calendar. Lohri is the Punjabi name for the festival which is also celebrated by other communities with different names. It is believed that Lohri has derived its name from Loi, the wife of Sant Kabir, for in rural Punjab Lohri is pronounced as Lohi. While others believe that Lohri comes from the word ‘Loh’, a thick iron sheet – tawa – used for baking chapattis for community feasts. There is another legend that Holika and Lohri were sisters. While the former perished in the Holi fire, the latter survived. Eating of sesame seeds – til – and rorhi – jaggery – is considered to be essential on this day. Perhaps the words til and rorhi merged to become tilorhi, which eventually got shortened to Lohri. Ceremonies that go with the festival of Lohri usually comprise of making a small image of the Lohri goddess with gobar – cattle dung, decorating it, kindling a fire beneath it and changing its praises. The final ceremony is to light a large bonfire at sunset, toss sesame seeds, gur, sugar-candy and rewaries in it, sit around it sing and dance till the fire dies out. People take dying embers of the fire to their homes. In Punjabi village homes, fire is kept going round the clock by use of cow-dung cakes. Frankly speaking, now a day, girls outshine boys in many fields when many girl children are killed in the womb. Gone are the days when Lohri day was usually dedicated to newborn boys but now it is celebrated, rather associated for little girls too. There is definitely a reason behind celebrating the Lohri for girl-child, when the parents are being neglected by their sons and Old Age Homes are coming in small and big cities, the sensitivity towards the girls has increased and parents feel happy to have a girl as our first child.